1. 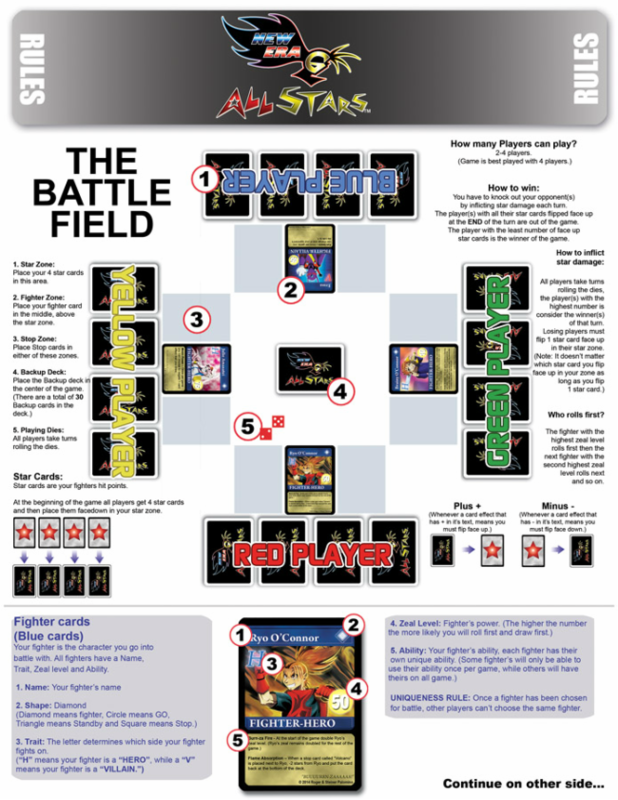 All players must pick a fighter card and their choice of colored star cards, after that place all the star cards face down. 2. At the start of the game all players must do a ZEAL CHECK to see who rolls first. 3. Players are knocked out of the game during the END PHASE. 4. 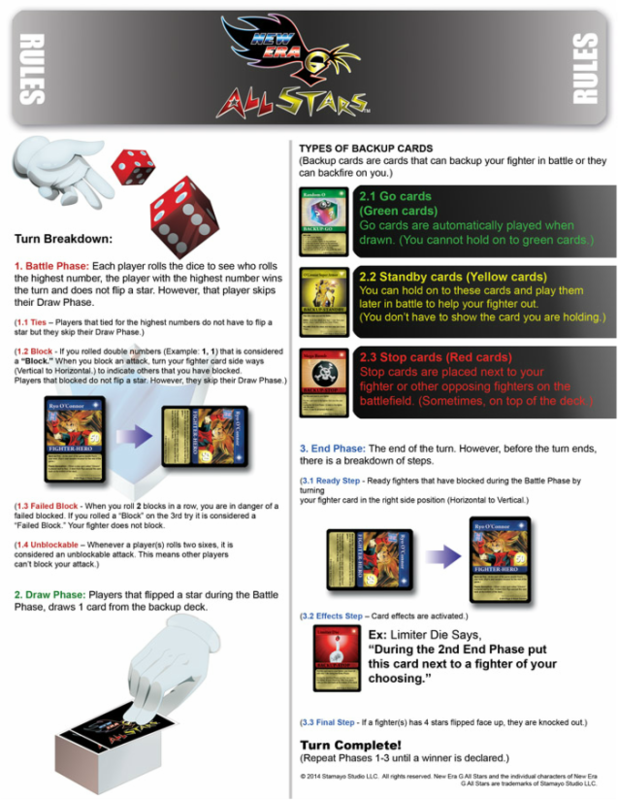 Winner(s) of the BATTLE PHASE do not draw a card during the DRAW PHASE! 5. Whenever a player blocks THREE times in a row, it is considered a FAILED BLOCK. 6. When a game has been won, players can switch out their fighter(s). 7. Uniqueness Rule: When a fighter is picked for battle, no other player can pick the same fighter of the same name. 2. TEAM FORMAT - In team format, teams will pair up to take down the opposing team. 1. Erasa - Eyes Lasers can only be played during the Battle Phase. NEWLY ADDED (June 10th) 2. 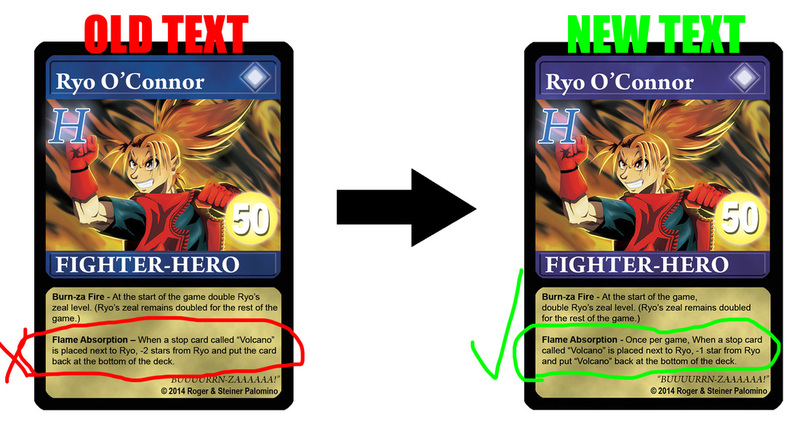 Ryo O'Connor - Flame Absorption - Once per game, When a stop card called “Volcano” is placed next to Ryo, -1 star from Ryo and put “Volcano” back at the bottom of the deck.